Plastic horizontal storage sheds have become a well favoured alternative with respect to the walk-in variety, their unobtrusive stance sits in confined spaces, evades planning permission issues whilst wrapped in a resin composition avoids future hassles concerning upkeep duties. Two models currently complete Lifetime’s range of low height sheds, both have identical designs and dimensions equating to their 75 cubic feet capacities, 6 x 3.5 ft dimensions. One represents the spotless appearance of a desert sand shade, the other exhibits a light tanned tint whilst their architecture displays appealing styling. We resolved the problems regarding constant maintenance issues outdoor wooden structures demand by replacing with a resin manufacture. Wood’s inability to survive weather attack when left unsheltered from the elements leads to yearly preservation coats of either varnish, stain or paint yet if left exposed throughout the following winter’s environment only leads to their further demise, requiring additional up-keeping. Lifetime’s High Density Polyethylene on the other hand resists such headaches, an effortless wash down when the grime emerges regards the undemanding role to rejuvenate the sparkling appearance when first assembled whilst the durable weather-resistant make-up ceases to succumb to decay whatever the weather throws at it; rain, snow or shine. 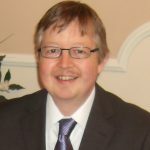 There are many benefits relating to Lifetime’s small stature sheds. Firstly their assembly is a doddle compared to the larger versions of walk-in sheds. Only requiring solid level foundations where to sit enables their plumb vertical stance ensuring the doors and lid open & close efficiently. Planning regulations are becoming quite strict in certain areas regarding erecting walk-in sheds, compelling many to avoid restrictions and pleasing their neighbourhood by virtue of constructing an inconspicuous low profile storage facility able to situate in confined areas like down the side of a house or under the height of a standard 6 ft fence-line. Sheltering two large wheelie trash bins, gardening equipment, tools, mower & lawn supplies, barbecue paraphernalia & grilling utensils, patio furniture, seating covers & accessories, a super shelter for bikes, an outside dry-store for fire logs whilst their fab access provides perfect accommodation for kids toys scattering the garden. Couple all these advantages with an attractive weatherproof facade that’s effortless to maintain appearances, it’s understandable for their sudden upsurge in demand. 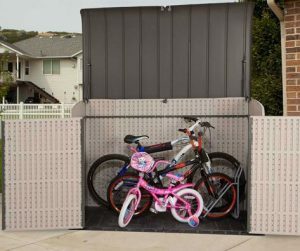 Indoor storage space is at such a premium nowadays, having an outside dry facility to cater for the abundance of outdoor stuff we accumulate provides an exemplary solution to our dilemmas. Lifetime’s manufacturing technique comprises of High Density Polyethylene Plastic (HDPE) where the resin make-up is molded into a double skinned construction, further enhanced through steel reinforcements sweeping around the internal structure providing rigidity and stability to the overall construction whilst designed to portray a stylish wood panelling effect. Combining with the resin ingredients regards the colour pigments, either a desert sand or a tanned finish dependant on model whilst UV stabilisation elements grant protection against colour fade, cracking or peeling when exposed to the sun. Many plastic constructions are susceptible to contract and expand very slightly when subject to varying degrees in temperature and return to their shape in normal conditions leading many to suggest a shaded spot is more favourable rather than being exposed to direct heat in hot climates. 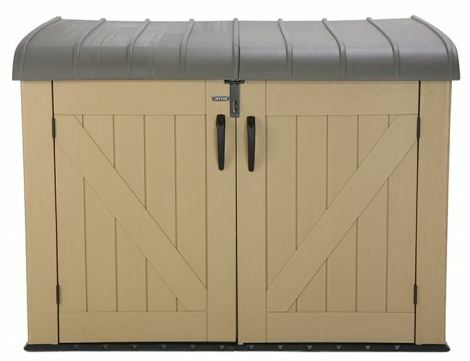 High Density Polyethylene Plastic provides a toughened composition resistant to dents and chips escaping that unsightly demise in appearance thin skinned metal sheds fall victim to whilst all the exposed metal framework and door hinges are powder-coated to prevent rust. Unlike a wooden structure, polyethylene provides the durable facade with armoury to subsist against weather attack without succumbing to deterioration, requiring no future maintenance roles concerning re-panting or re-staining to manage protection. When the grime becomes noticeable, Lifetime’s plastic only requires the minimalist role of a wash down with warm water containing light detergent, removing the dirt with a cloth or soft brush. Many just lightly pressure hose them down, a job I’ve come to quite enjoy, sure beats the headaches wooden structures entail. Accessibility couldn’t get any better, opening the double doors and lid provides triple door entry exposing the entire unit for easy admittance to storage whilst the lid opens independently to the doors making the low profile design adaptable for a wheelie trash bin storage solution, usable whilst enclosing them from view. The lid swings open either at a 45 degree angle or near vertical upon entry by virtue of user-friendly weather-resistant spring hinges delivering enhanced support to the heavy lid, aiding opening due to the springs force whilst preventing the full weight slamming shut on fingers. The lid comprises of an attractive yet impervious weatherproof design, described in the composition above. The very slight slant and super curvature delivers excellent rainwater drainage with a modish architectural finish whilst extending beyond both sides, back panel and doors results in a dry internal environment critical for storage preservation. I haven’t read one review regarding rainwater gaining entry inside these units. Both doors on the frontage open right out providing easy unrestricted access, their opening mechanism relates to two weatherproof hinges and a large grip-able handle per door however to enable opening the doors requires you to lift the lid. Upon closure, a locking clasp designed for a padlock adjoins all three doors together accomplishing a triple door locking system to enable securing the shed. Padlock is not included. The floor is an integral part of the structure concerning Lifetime sheds delivering reinforced support to the entire construction however this built-in feature also serves additional dry & clean benefits regarding the prevention of outside debris blowing inside, a desirable design preventing leaves congregating inside around Autumn time and rainwater puddling the shed floor. The base is a polyethylene resin manufacture with additional toughening thrown into the mix providing a floor capable of surviving endurance pressures regarding wheeling in a weighty lawnmower, bicycles, wheelie trash bins and storing heavy duty supplies like fire logs. Constructing Lifetime’s low profile sheds are very straightforward taking the majority a couple of hours to accomplish the final build. Common household tools are all that’s required to assemble however two people are necessary for fixing the lid to the shed body, one supporting whilst the other secures with screws. The procedure regards interlocking the panels together with the base and securing the steel supports following on to assembling the hinge springs and door hardware; resulting in minimal construction time compared to walk-in sheds, reason for their popularity. Achieving the perfect construction requires working slowly through the order of the instruction steps represented by illustrations implementing what’s shown, then make sure you have a solid level foundation for the shed to sit on enabling the plumb alignment of the doors. Whether intentions are to accommodate a lawnmower, bicycles, gardening equipment or patio furniture etc, all items do vary with respect to measurements. Lifetime’s Horizontal Resin Shed provides the departure from upkeep duties with it’s weatherproof High Density Polyethylene composition whilst the undemanding role of a spray-hose down simply rejuvenates the shine when the dirt appears. This mini shed design delivers avoidance from planning laws, the inconspicuous low profile stance can be located where space is tight whilst the short height sits under a standard garden fence-line pleasing surroundings and neighbours. Inclusive of a 5 year limited warranty, straightforward assembly and a virtually maintenance-free future represent the reasons why this style is a well favoured alternative to the larger walk-in sheds leading many people to purchase additional sheds this size to organise their outdoor gear. 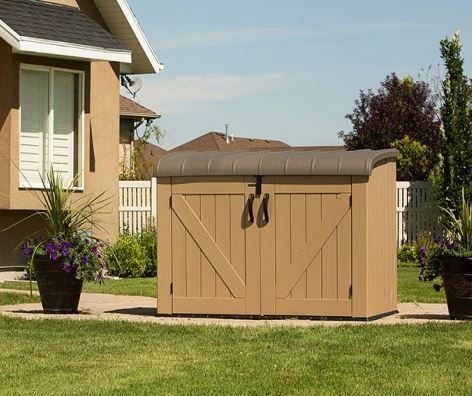 Thanks for reading Lifetime’s Horizontal Shed review. Any related mini-shed queries? Please drop them in the comment section below. Happy to assist where I can. Please share with you social friends. Thanks you! Is there a size that could accomadate 3 tall toters? 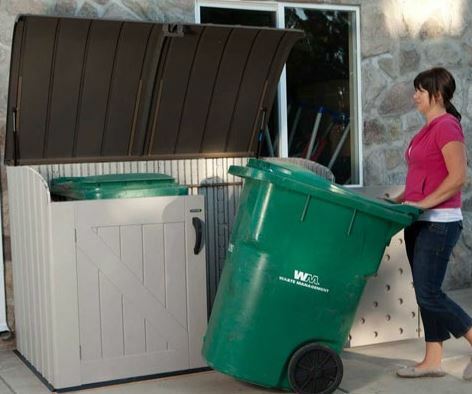 All wheelie bins / toters vary in size. I have placed the internal measurements above the image with the lady wheeling her trash bin up above. 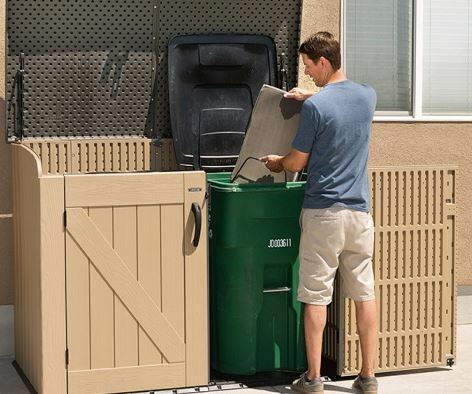 Measure your bin measurements against those internal dimensions to make certain they will fit. Keter Factor 6 x 4 ft shed may deliver a walk-in size, again check internal dimensions. I really appreciate how this shed opens up completely. That would be so handy in fitting more things in a compact, smaller unit. I also like the design of it’s roof. You don’t see that every day. I’m a fan of the gray color but not so much the brown. Glad they have options. 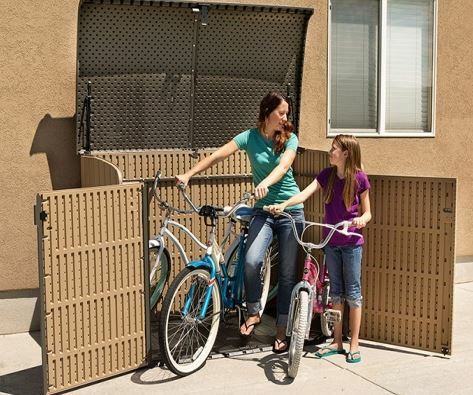 Thanks for dropping by to read about Lifetime’s plastic horizontal storage sheds. 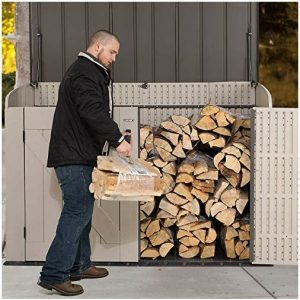 The 3 door opening system delivers super access into Lifetime’s mini sheds, the lid works independently to the doors however you do have to open the lid to enable opening the two front doors. These are compact, fit in restricted zones yet sit under the height of a garden’s 6 ft fence-line, their unobtrusive stance is one of the reasons for their popularity. A few of our friends have opted for a couple of these low profile units rather than the walk-in variety to organise their outdoor storage, escaping construction headaches. The roofs are designed into excellent rainfall drainage systems with their slight angle plus curvature frontage. Colour-wise, everyone is different as are locations, this depends on one’s tastes hence Lifetime’s options. 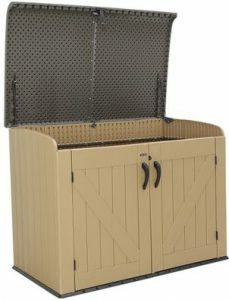 I have made a purchase of one of this horizontal shed over 8 years back and it was the best money I have ever spent. It sits in my backyard, undergoing different weather conditions and it still remains in perfect condition. My tools and lawn equipment are well protected in this shed. I am thinking about upgrading to a much larger one cause I have out grown this one a long time. Can I buy one and pay to assemble it? or is the installation an easy process that I can do myself? 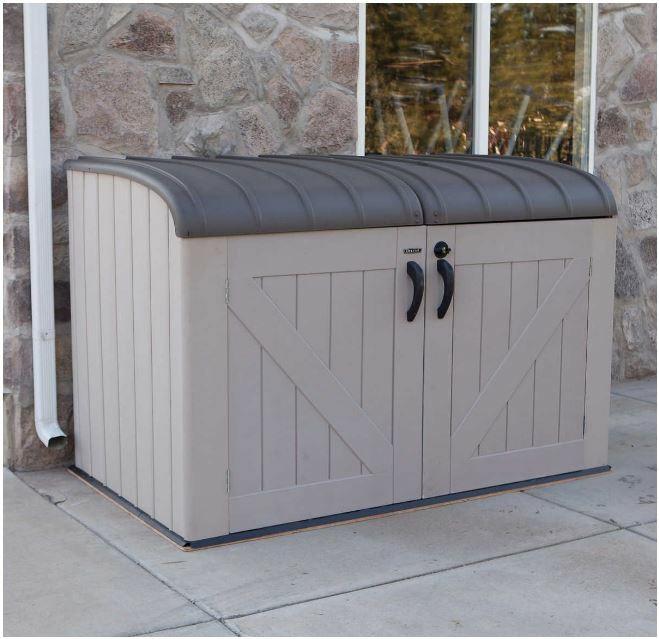 Thanks for dropping by and reading about Lifetime’s plastic horizontal storage sheds. Larger walk-in sheds are assembled through a similar process however they do take a lot longer to construct due to their size however it’s imperative they are constructed on solid level foundations. We found by adhering to the foundation rules simplified constructing into an enjoyable assembly day. Solid level foundations pay homage to all the panels aligning at ease during assembly due to starting off from a level base, the roof weight applies equal force on all sides preventing leaning pressures and the doors align plumb to swing efficiently. A solid base aids the floor’s hard wearing credentials, making it able to survive the stresses of wheeling / driving in weight equipment and storing heavy items. You can assemble your own shed like we have done however where I point visitors towards prices in the USA, assembly is offered for nearly all walk-in sheds if you wish to escape construction. You do require solid level foundations in place prior to installation.